The Granite State Pro stock Series officially brought its season to a close on Saturday March 3 at the Thompson Motor Sports Park clubhouse. The season ending banquet of champions was a chance for the teams of the GSPSS to get together one last time as part of the 2017 season and honor their champions. 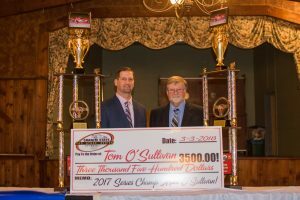 Tom and Mike O’Sullivan were officially crowned owner and driver champions making them the first multi-time champions in series history. The duo also took down the 2012 series championship and have been competitors with the series virtually since day one. They received a pair of championship trophies, point fund money as well as a pair of championship jackets from American Racer Tires. In addition to crowning the champions, a number of specialty awards were given out. Scott MacMicheal was crowned rookie of the year as he and his Bob Labine owned team had a successful first season together. The pair also finished the season second in the season ending point standings after a spirited battle with eventual champion O’Sullivan. Also given out was the annual “John Boy Hoyt memorial dedication to motor sports award”. This award is given to someone who goes above and beyond for the sport of auto racing. For 2017 the staff of the GSPSS chose to honor series president and race director Mike Parks. Parks not only founded the series with John Hoyt, but for 2017 Mike chose to get out of the driver’s seat and focus more on the operation of the series. The final group to be honored were the top ten in points, eight of whom were in attendance to receive their trophys, point fund money and be honored by their fellow competitors. O’Sullivan, Macmicheal, Lascoula and Cory Casagrande were all in the top five in points and picked up hardware Saturday night. Josh King, Tommy O’Sullivan, Devin O’Connell and Mike Mitchell finished six through nine in the standings and were also in attendance. Mike Scorzelli wound up tenth in the owners standings and picked up a point fund check for his efforts in 2017. With the 2017 Banquet in the books it is on to the 2018 GSPSS season. On tap for 2018 is a twelve race schedule highlighted by a return to NHMS for the second annual short track showdown, a three segment race, the annual JBH memorial race and a soon to be announced event that could become an annual highlight on the GSPSS schedule. The season kicks off with a test and tune date April 28 at Claremont Speedway and the opener the following Friday night. The complete 2017 point standings as well as the 2018 schedule and more can be found at gspss.net.